Top 20 Sessions you must see at VMworld 2017 » Welcome to vSphere-land! There is no way you are going to be able to see 20 sessions at VMworld, so pick the ones you like most and have the speakers you’d like to see in person and prioritize those. Watch the recordings of the others afterwards. I’m a bit biased towards storage sessions, but hey storage is pretty damn interesting these days. I’m also a bit biased towards the sessions I’m presenting in, so that’s just me but I’d love to see you at them and we’ll do our best to give you a great educational session. So now in no particular order (well maybe a bit alphabetically as that’s how the Content Catalog is listed), but I’ll start with mine though. First up is a great deep dive on VVols replication, this one will be super techie and deep and we promise not to put you to sleep. 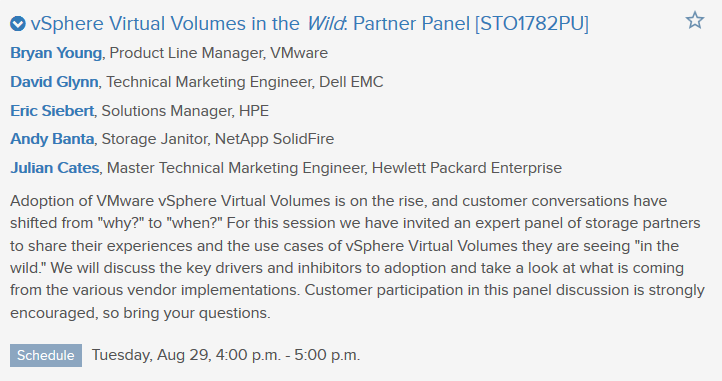 Next we have a VVols panel session with some VVol industry veterans and VMware’s VVol product manager, bring the tough questions for us, we can handle them, if we can’t Pete Flecha will drink a shot. 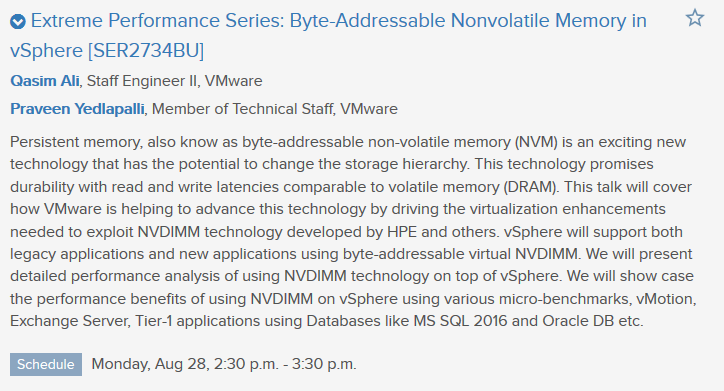 Next up this one sounds uber geeky, hear deep storage info directly from VMware’s storage vWizard and one of Pure’s technical geeks. Next up, an Encrypted vMotion deep dive and a glimpse into the vMotion crystal ball, sounds fun. Now we go extreme with NVM. 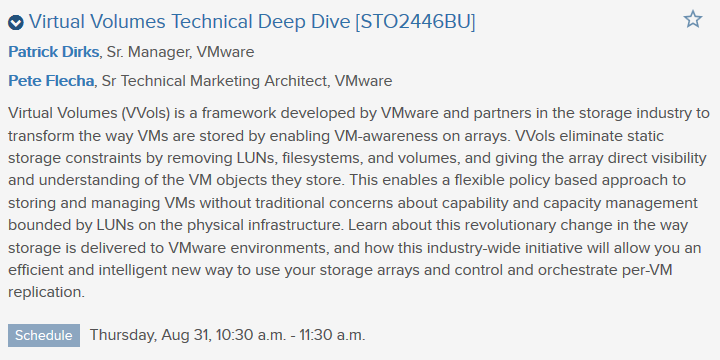 this should be super techie, there is like 8-9 different Extreme series sessions at VMworld. So if you are into extremes there are plenty to choose from. Next for security geeks, this one sounds interesting as to how software-defined is changing the way we think about security. Now we go the the clouds, I’m sure AWS will be a hot topic at VMworld this year, who better to hear about it from then Frank & Emad. Next we go to get educated on NVMe and how it’s changing the storage landscape, is Flash dead already? Now we dive into scripting with PowerCLI, every good admin needs some scripting skills and this session looks to hone yours. Next up more NVM! You can never get too much NVM, this one looks to answer the tough NVM questions. 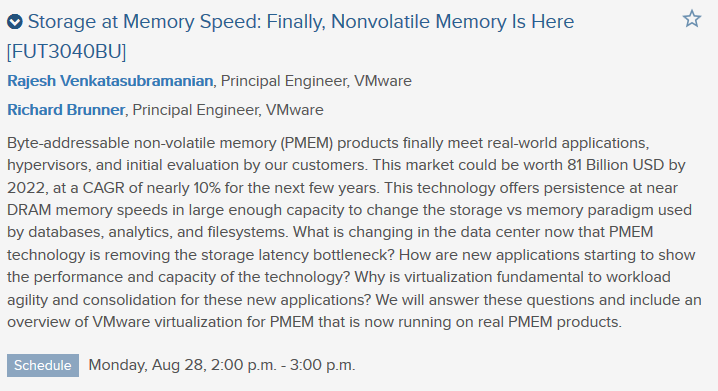 Now it’s vSAN time, there are like a billion vSAN sessions at VMworld so you can easily overdose on them. I thought I’d pick out a few of the more interesting ones like this one from VMware’s storage godfather. Next there is the Rocky Mountain Way and then their is the VCDX Way, if you are upgrading vSphere you probably want to do it the VCDX Way. Now you have the 3rd annual (or is it 4th) Patrick & Pete VVol technical deep dive show (PPVVTDD). 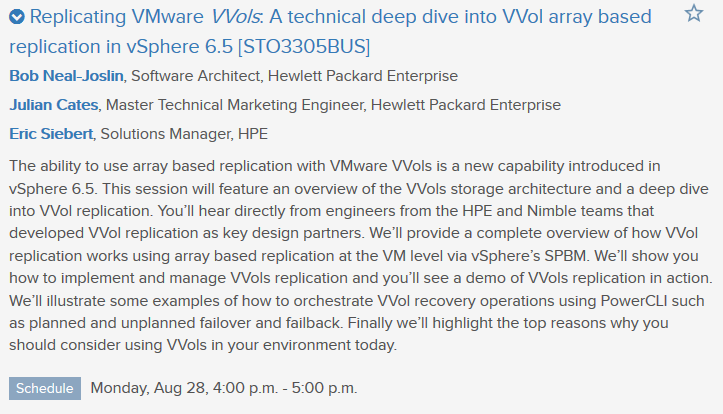 Here directly from the VVol guru’s at VMware on everything related to VVols. Next up we head back to the clouds to learn more about AWS from a storage and availability perspective and how to keep all your bits and bytes safe in the cloud. Now we have, wait for it, more vSAN! As a storage guy I love I/O’s so this one sounds mega geeky and interesting, I always wondered what I/O’s did for fun. Next more security, I forgot to mention I’m really into security also. What do you get when you combine a security geek with a vSAN geek? 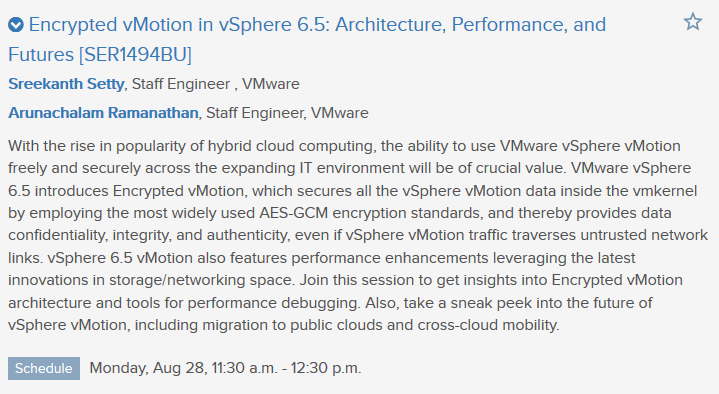 Why this session, should be a good one and you can leave feeling much more secure about yourself and your VMs. And finally let’s end on a storage session packed full of all sorts of best practices, because you always wanted to know the answers to the ultimate vSphere storage questions (spoiler: it’s 42). You can tell this one will be popular as it’s scheduled on 2 different days. Well that’s my list, there are a ton of other good sessions at VMworld, so go there and enjoy them and have fun! Ha, yeah I’m not much of a networking guy, heard there will be lots of good NSX stuff there though for people that want it.